Dan Brown’s novel “Inferno” was nearly boycotted sometime ago because it claimed in its pages that the “gates of Hell” is somewhere in Manila. With “Daang Matrapik,” it became an understatement. The novel could have bravely alluded to Manila as Hell itself with no one protesting! Ask commuters, millions of them, who are gravely affected by the horrendous traffic they must have to endure daily, at any time of the day, and one gets the sneaky expression of Hades already. That is right Folks, “Daang Matrapik” seems to be the new normal in the perfidious configuration of urban life in Metro Manila. Before I left for Metro Davao (a motorist’s paradise compared to Metro Manila) sometime in the mid 90s, EDSA was a 24 km super highway, a six-lane thoroughfare on each side, free flowing, organized and almost traffic free. Now, passing through EDSA is no longer pleasurable. If there is a learning advantage one gets in the process, it is only in internalizing the wisdom on the art of being patient that comes to mind. 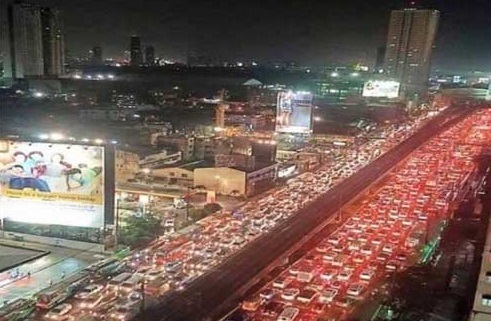 It’s just that there is little indication that a Filipino by nature is easily pushed into rage otherwise; the entire stretch of EDSA would have been splattered with dead bodies mostly coming from the ranks of drivers. While traversing EDSA sometime last month, I was even tempted to bump a wayward bus, alight from my car with bazooka and aim it at the bus driver and to hell with everyone. I may have held my patience once but I had similar situations along the stretch of that f***king road. I could have snapped except that I had no bazooka but just a couple empty bottles of mineral water. Had I not prayed that day and had I armed myself, I could have mounted a war on EDSA and who cares who gets damned that instance! And I would presume that I was not the only one among millions of affected souls who were only waiting for a triggering insinuation and yes, hell would have dawned. Before I got conscripted into the mayhem I was able to check my plane ticket back to Davao and that saved the day for me, actually that saved the metropolis from my hands! Posted on September 12, 2015, in Uncategorized. Bookmark the permalink. 1 Comment. Hi, this weekend is good for me, because this occasion i am reading this great educational post here at my house.